This was a story that I heard about, but haven't read just yet. Three families come to buy, trade, or rent their parents without success. As soon as the twins sell their parents to the fairy orphan, she transforms into a witch who wishes to eat them in a stew. How will the twins save their parents? 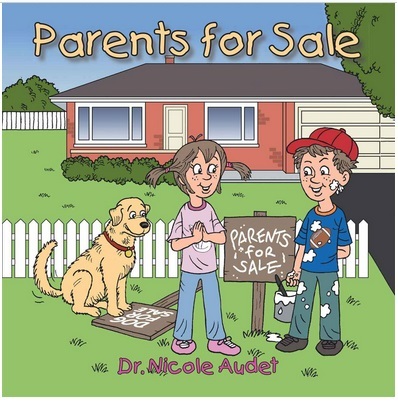 Parents for Sale by Dr. Nicole Audet is a charming and amusing children's story offering a unique type of life lesson learning, and enticing the imagination of its young reading audience. Dr. Nicole Audet has created a tale containing a lesson within, but with a twist in the plot only a youthful mind could fully understand and appreciate. The imagination of a child is a powerful and unique attribute. The mind of a child is often unpredictable and excited by the unseen or magical elements that make thinking, creating, and learning fun. The author adjusts her writing to depict what the mind of a child would imagine. For example, as an adult reads and starts to comprehend the story and its plot, the adult mind would assume the story and its message would end with that life lesson being played out in a learning experience, such as a punishment or something of the like, but in fact it does just the opposite. The story leans towards a happier ending in the way a child would imagine it. This is exactly why the story is brilliant and perfect for young readers; they can absolutely relate its concepts, emotions, and imaginative text. This book really sounds like something that my son would love to read. He loves stories that involve crazy twists like what's talked about in the synopsis. I'm going to have to get him a copy.